I do realize that I have been slow on my updates lately. Mainly because there has not been much change in the overall fishing conditions. Old man winter has finally arrived. Even though we have not received much snow or really cold weather recently. For Western New York, All of our smaller creeks and streams are totally locked up with ice. The only open water we have for now is the Genesee River and Oak Orchard. Water flows in the Genesee River are still on the high side. If this cold weather processed water flows should continue to drop on the Genesee River. As for the Oak Orchard River, Just the opposite continues water flows have been acceptable but for this time of the year, on the low side. Despite the conditions on the Oak Orchard there is a few fish around. But we do need some high water for the Oak to get things on track. Salmon River area pretty much the same thing goes, all the smaller rivers and creeks are iced up. However the Salmon River watershed has received considerably more snow. Water flows at this time are at 750 CFS, I suspect this release will come down as the cold weather persist. 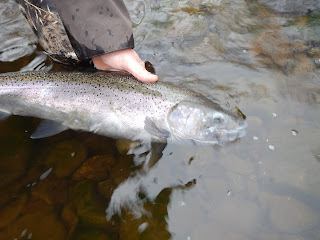 The 750 CFS is about the top end of water flows that I like to fish during the winter. The good news is, this has been stable water flows and water temperatures for approximately 2 weeks. there was fish scattered about from the lower fly zone on down to the route 2A bridge. For now, the best success has been using a lot of persistence.